Since the June 28, 2006 Israeli repeating bombing of Gaza’s sole power plant—destroying all six transformers – Palestinians in Gaza have neither been allowed to import the transformers and materials needed to rehabilitate the plant, nor offered an alternative solution. Through the now-destroyed tunnels, Palestinians did import smaller transformers and got the power plant hobbling again, but never to full capacity. The supply of electricity bought from Israel and Egypt doesn’t suffice for Gaza’s now 1.8 million Palestinians. The crisis impacts on every facet of life: hospital functions, sanitation, water supply, refrigerators and appliances, and education. In 2006, B’Tselem noted: “The sewage system is on the verge of collapse.” Mohammed Omer’s photos of the village of Um al-Nasser, flooded with overflown sewage in 2007, should have been a wakeup-call if official institutional and NGO warnings are not. At least five drowned in their own sewage, including an infant. A year ago, reports from Gaza showed the misery of Palestinians’ homes flooded with a combination of that same overflown sewage compounded by heavy rains. Kids waded through sewage to get to school; elderly were, if lucky, paddled by small fishing boats. This, save the rains, was entirely preventable…if the UN and influential world bodies and leaders truly cared and dared to face up to the Israeli lobby. Israel has shattered Gaza’s economy in a variety of clever ways: firing on farmers and bulldozing and burning their land; firing on fishers and stealing their fishing boats and equipment; bombing businesses and factories and preventing the materials needed to rebuild; drastically restricting imports. And banning exports save a token few trucks when Israelis need palm leaves for Jewish holidays. Oxfam in December 2014 noted: “Under the blockade, exports from Gaza have fallen to around 2 percent of pre-blockade levels, with devastating impact on the economy. While some extremely limited exports to international markets have been approved, the transfer of produce to Palestinian markets in the West Bank – and markets in Israel – has been banned since 2007. These were traditionally the most important markets for producers in Gaza.” And it isn’t only produce. Furniture, clothing, and a surprising number of other goods which once flowed from Gaza’s borders are banned from being exported. Aside from Gilbert’s heart-breaking observations on the slaughter of Palestinians, he notes poignantly, “The average age is 17.6 years, …a child ghetto of 1.2 million children and young people are being denied the right to escape the bombs, to fly, because they cannot get out.” This, incidentally, was the third major massacre for Palestinians six years or older in Gaza since December 2008. The 23-day in 2008-09 offensive killed over 1,400 Palestinians. I shared the three plus weeks of hell, losing my own fiends to Israeli bombs and bullets, meeting tortured parents and families whose children had been shot dead point blank by Israeli soldiers. Like Amer al Helu’s infant daughter Farah; like 4-year-old Ahmed al-Samouni with two bullets to his chest; like KhaledAbed Rabbo’s 2 and 7 year old children, shot dead by soldiers casually snacking on junk food. Canada’s CBC interviewed then-frantic me some days after my medic friend Arafa was murdered by an Israeli dart-bomb shot directly at his ambulance, after the media building I was in was bombed, and after I had seen more mutilated bodies and white-phosphorous-charred skin than I could have imagined. My interview-balancing counterpart, a Canadian volunteering at an Israeli base, gushed about the weather and what a relaxed time he was having… and, oh yes (to the prompting of the CBC host), he did have to run down to the bomb shelter the other day. I’d just finished saying there were no bomb shelters in Gaza, everything was a target, the Israelis were even bombing schools, kindergartens, hospitals. Post-massacre, as I’d walked through the ruins of Ezbet Abed Rabbo to the east of Jabaliya, my friend from the neighborhood (whose mother was killed in the very first minutes of bombings as she walked to buy bread), joked in the way oppressed people do when getting on with life, “they make like art here,” gesturing to the graveyard of houses surrounding us. On November 22, an Israeli soldier shot and killed a Palestinian bird hunter 500 metres from the border, east of Jabaliya, shooting him in the back. The same day, in southeastern Gaza, an Israeli soldier shot a 17-year-old Palestinian in the chest. He was 1500 meters from the border. The combination of Israeli jeeps present at the border and the remotely-controlled machine gun towers make Gaza’s border region – the most fertile area of Gaza – a killing field. 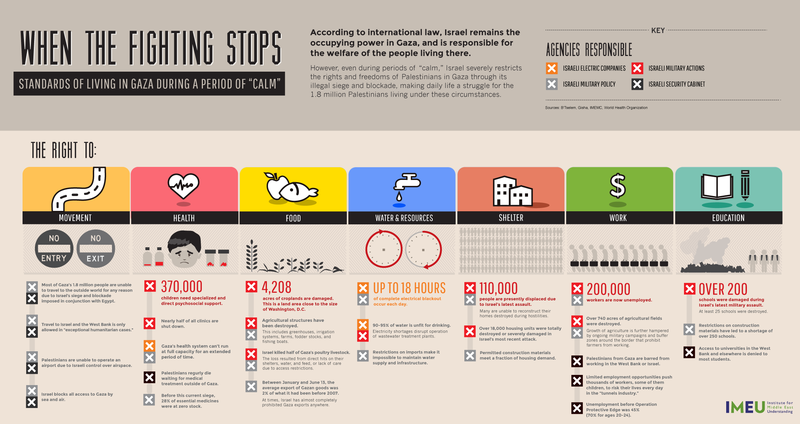 Naturally, these incidents, daily realities for Palestinians, didn’t make the headlines. Egypt has also long-since destroyed the network of tunnels which were known as Gaza’s “lifeline” for a very good reason: they imported the goods, including building materials, that Palestinians needed and Israel bans. They also served as an alternative conduit to the normally closed Rafah crossing, and having seen them I can attest they were far more efficient than the bureaucracy of the Egyptians’ border crossing terminal. But they are largely extinct, and reports have Egypt creating a buffer zone extending 1 km to ensure the tunnels don’t re-manifest, and to tighten the already strangling noose on Palestinians in Gaza.